The NILFISK SC8000 is a battery powered riding scrubber. This maneuverable front steer scrubber houses the widest deck in its class. 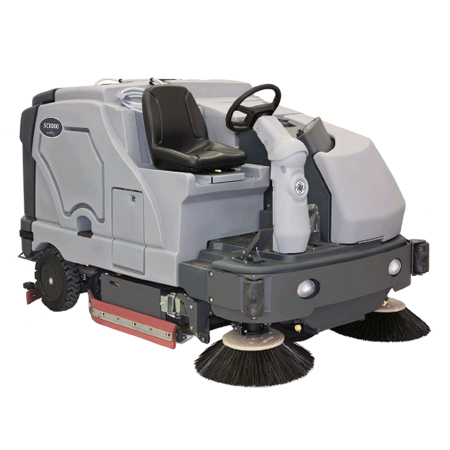 The deck's dual counter-rotating brushes are capable of sweeping and scrubbing in a single pass. The unit had an ergonomic cockpit with touch-pad LED operator panel making them simple and intuitive. The NILFISK SC8000 has four different cleaning systems that allow you to customize the scrubber to your facility's needs. It also has tools-free removable squeegee, brushes and blades for reduced maintenance time and no timing belts or chains to reduce costs.